Specifically designed for use in the electronics and electrical industry. Cushioned polyurethane seat and back rest that can be washed clean. Ideal for clean room and laboratory environments. 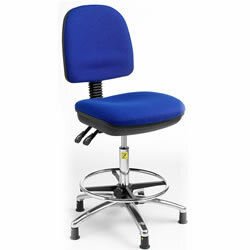 Fully adjustable backrest with gas lift height adjustment, fully tilting seat and adjustable foot ring.